In this tutorial we will learn How to make out PIC projects wireless by interfacing a Bluetooth Module (HC-06). In our previous tutorial we have already learnt How to use USART module in our PIC Microcontroller and established communication between PIC and Computer. If you are an absolute beginner then check here for our all the PIC Tutorials, where we have started from the scratch, like learning MPLAB and XC8, interfacing LED, LCD, using Timers, ADC, PWM etc. Here, we have used the popular Bluetooth module HC-06. Using this module we can receive and send information wirelessly from our PIC MCU to a mobile application or a computer. Communication between PIC and HC-06 is established using the USART module present in the PIC Microcontroller. You can also use the HC-05. We again operate on the same Asynchronous 8-bit mode, but this time we will modify our code a bit so that it works with the Bluetooth module. Hence learning UART tutorial beforehand is an added advantage for this project. In this tutorial, we will toggle a LED by sending on or off command from our Smart phone. We will use an Android application called Bluetooth Terminal which can send and receive data over Bluetooth. If we send a char ‘1’ from the app the light will be turned ON in the PIC board and we will get an acknowledgment back to the phone that the light has been turned on. Similarly we can send ‘0’ from phone to turn it off. This way we can control the LED light on our PIC board, similar to the UART tutorial but now wirelessly. Complete Program and the Detailed Video is given at the end of this tutorial. The basic block diagram for the setup is shown below. Like all modules (ADC, Timer, PWM) we should also initialize our Bluetooth module. The initialization will be similar to UART initialization but we need to make some changes for the Bluetooth to work flawlessly with our PIC16F877A MCU. Let’s define the configuration bits and start with the Bluetooth initialization function. Almost all the Bluetooth modules in the market work at a baud rate of 9600, it is very important to set your baud rate same as that of Bluetooth modules operating baud rate, here we set SPBRG=129 since we are operating at 20Mhz clock frequency with 9600 as baud rate. Hence the above initialization will work only for Bluetooth modules operating at 9600 baud rate. It is also mandatory to have the high speed baud rate bit BRGH enabled. This will help in setting an accurate baud rate. If you have a BT module which operates at a different baud rate, then you can refer the look up table below to find out your value for the SPBRG. Once the function is initialized we have three functions in our program to send and receive data from Bluetooth. Unlike UART we have few things to consider here before we can transmit or receive data. The Bluetooth module has a Transmit and Receive buffer inside it, the data sent to it will be stored in the Tx buffer. This data will not be broadcasted (sent on air) unless a carriage return is sent to the module. Hence in order to transmit data we have to load the Rx buffer of BT and then broadcast it using carriage return. The above working can be easily achieved by using the following functions. The below function can be used when we have to load only one character into the Rx buffer. We load the data into the TXREG register and wait till it is processed by check on the flag TXIF and TRMT by using while loops. Below function is used to load a string into the Rx buffer of the Bluetooth module. The string is split into characters and each character is sent to the BT_load_char() function. Till now we have just transmitted information into the Rx buffer of the HC-05 module. Now we must instruct it to broadcast the data over air by using this function. In this function we send a value 13 into the TXREG register. This value 13 is nothing but the decimal equivalent for carriage (refer ASCII chart). Then a small delay is created for the broadcaster to start. If the user has sent a data, this function will return that particular data which can be saved in a variable and processed. If the user has not sent anything the function will return zero. We have used all the above explained functions inside or main function. We send some introductory message and then wait for the user to send some values based on which we toggle the RED led light connected to the RB3 pin on our Perf board. Check the Full Program in the Code Section Below. Now let us proceed to the hardware. Once the connection is done it should look something like this. Now let us get our Android application ready. Download the application called Bluetooth Terminal from the App store or use this link. Once the application is downloaded and installed, turn on your PIC perf board which we are using since beginning. The small LED light on your Bluetooth Module should be flashing to indicate that it is powered on and is actively looking for a phone to establish a connection. Now get into the Bluetooth Settings of your phone and search for new Bluetooth device you should be able to see the name HC-05 or HC-06 based on your module. I am using HC-06 hence my phone shows the following display. Then try paring with it and it will ask for a password. Enter the password as 1234 (for some it might be 0000) and click OK as shown below. After the paring is successful, open the Bluetooth Terminal application that we just installed. Get into the settings option and select “Connect a device – Secure” as shown below. This will open a pop box where all our paired devices will be listed as shown below. Select the HC-05 or HC-06 module. Once the connection is established, the light on the Bluetooth module which was flashing so far must have become constant to indicate that it has successfully connected to your mobile. And we should get the introductory message from our Program like shown below. Now press ‘1’ to turn on the LED light and press ‘0’ to turn off the light. The complete working will be shown in the Video. Your mobile screen will look something like this shown below. So that is it guys, we have learnt How to Interface Bluetooth module to our PIC microcontroller, now with the aid of this we can try wireless projects. There are lots of projects which uses Bluetooth, you can try them or come up with your own Idea and do share them in the comment section. Also check our previous project with Bluetooth terminal app and HC-05 like Smart Phone Controlled Home Automation Using Arduino and Smart Phone Controlled Digital Code Lock using Arduino. Hope, this tutorial helped you! If you got stuck somewhere, kindly use the comment section. Many have this tendency to set the Tx pin as output and Rx pin as input. But, according to datasheet both the bits C6 and C7 should be set to enable the UART function. As far as the datasheet terminologies are concerned the term "set" means to make a pin 1 (high). The term "reset" or "clear" means to make a pin 0(low). Hope this clears your doubts! 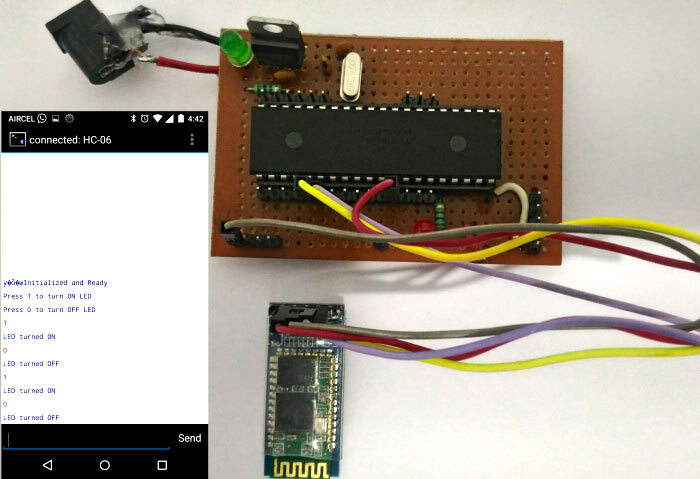 hi, i have tried your project and i have successfully paired my phone with the bluetooth module. the thing is that after i connect device with the app, nothing show up like your simulation does, and i tried sending out 1 and i still get no respond. can you help me? 2. Have you made any changes to the code? If yes check them again. 3. Did you run a simulation for your code did it work as expected? hello sir i am learning about how to interface pic 18f4520 to bluetooth HC-05. Hi sir I am using a pic16f886 with a hi tech c compiler and pickit 3, however this does not seem to be working for me, I had to modify the configuration since I am using a hi tech c compiler. The edits I made are shown below, everything else was kept the same. Did you try simulating your modified code? I could pair with using my phone, however it did not respond whenever I sent it a 1 or 0. Is this what you mean by simulation sir? i would be very glad, if not don't worry.. still thank you :D.
Make sure you HC-05 is working in 9600 baudrate. Some modules tend to work with other baud rates also. Also if you are stuck here you can use a MAX232 module to connect you pic Tx and Rx to computer and monitor if the serial data is sent/received as expected. Kindly can you guide me regarding USART. From where i can learn using USART with pic18 ? i added interrupt routine in the code and it straight away wont receive anything. what is the issue there? I might have to take a look at your code to find what is wrong!! Hi, I use MAPLAB IDE v8.66 and a 16f917 microcontroller, I can't use #pragma config, so I used the configuration bits menu. I tried to send data by TX with SPBRG=129 but I haven't the good number of baud, I have only 2000 baud and I haven't the good delay. So I change SPBRG, I did many try, and I don't undersand why, but I can down under SPBRG=100 else I have nothing. Do I need an external clock to work in HS occilator? Hi, B.Aswinth Raj. I am trying to implement this code using my PIC18f4550. The pinout is very much like yours on pretty much everything that I've seen when comparing the two PICs. I can connect to the HC-06 using the phone app but no intro messages come up and the led does not come on when entering 1 along with no message back. Is there anything i am missing that is different? I am sure that the same code cannot be used for PIC18f4550. Although it would require only minor modification. Sadly, I do not have a PIC18f4550 with me to test the code. I would recommend you to understand the code and then read the datasheet to know where the changes has to be made. could you please send me what modifications have you done dealing with pic18f4550 ? Can we send a message like a string instead of single character like 0 or 1 from the bluetooth terminal software and get it displayed on an LCD device ? So,total how much relay we are connected to it. I want to interface my pic kit wth the android app developed by me.. I connected everything and i am using PIC16F877 and HC-05. LED is not toggling. Firstly my min question is in the video that you posted at first it should show /how some introductory message once on power up according to code as below. But why didn't the introductory messages are shown on the phone in the video ? 1) 1st question is, you have said that Tx of bluetooth connect to Tx of MCU and Rx of Bluetooth to Rx of MCU, It is right? because generally we connect in Rx-Tx and Tx-Rx (opposite Form). 2) 2nd question is , I did not understand why you load 129 value in SPBRG , In USART Tutorial u gave one formula to calculate Baud rate , then according to that formula value should be 12, right? ?, please clear me If am wrong. I am following your tutorial using the PIC 18f1220. I have been using the debugger to run my code and part of it works. When I broadcast the first string and carriage return, it does send it to my phone. But when I try to send a second string, the debugger halts for some reason. It also works when I transmit two or more carriage returns, so I believe there is an issue in the "BT_load_string" or "BT_load_char" functions Do you know what might be happening? I have searched the bluetooth datasheet, and I haven't found the part where it says you need to send a carriage return for broadcasting ? Where/how did you find this? TRISB3=0;-->What I/O Declarations of RB3?? The schematic can't find this wire. I changed the code to make it work with PIC12f1572 with XC8 compiler. When I connect to the HC-06 with my phone. I do not receive any message. So I believe threre is something going wrong in the communication between the PIC and the HC-06 module. Can you help me find my mistake? hi, i have tried your project and i have successfully paired my phone with the bluetooth module. the thing is that after i connect device with the app, nothing is happening in the output Led when i send 1 and 0 to BT. I had used same program.